I was in the gym the other day, struggling with what I wanted to say about Delhi in fiction, feeling a little stuck. The one treadmill in my gym from which you can see the Qutub Minar happened to be free so I stepped on to it and looked up. There it was, framed between two buildings of a public sector undertaking’s housing colony: a sandstone minaret towering over the landscape, various cellphone towers huddling around it like footsoldiers under the emperor’s elephant. And just as I set eyes upon it, the ghost of Khushwant Singh came and showed me the way forward. Anyone who writes fiction set in Delhi, like I do, and hopes that the city plays a critical role in the development of the fiction they write, like I do, must always write in the shadow of Khushwant Singh’s Delhi: a novel. Everyone has their favourites, of course–I can hear the click-clack of the keyboards of the partisans for Ahmed Ali’s Twilight in Delhi or Krishna Sobti’s Dil-o-Danish–but bear with me while I try to convince you why, even if it may be possible to argue that for sheer artistry and literary merit Dil-o-Danish is a clear winner, Khushwant Singh’s Delhi is the Delhi-est of all Delhi fiction. 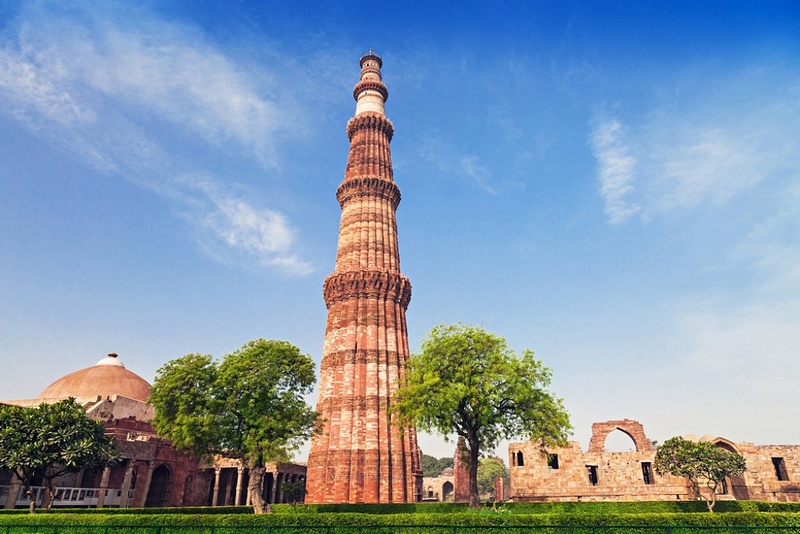 This little riff turns the burnished glory of the Qutub Minar into something tawdry and familiar: a construction project that is an occasion for contractors and government officials to make money. Suddenly it becomes crystal clear that the bulk of the wealth in this city flows from the fact that the government resides here, and that this has always been the case. Whether it is the small feathered nest of the public sector employee who lives in the building my gym looks out on, or the multi-crore “farmhouses” and gated-community apartments of South Delhi or Gurgaon. Even your writer, who benefited by being educated in this city because his father worked in the government, and was able to parlay that education into a modicum of success, must trace his own modest success back to the same source. And it’s not just in the now: the massive and beautiful havelis of Delhi were first built by courtiers who needed homes befitting their status, the merchants who opened the legendary shops that are now considered our heritage came here to feed, clothe and provision the large populations that served that court. The intellectual hubs, the homes for the classical arts, the publishers and the literary establishments, they all trace their presence in some way or the other to the fact that empire of India has been governed largely from Delhi for several hundred years, and continues to be governed from here. In one small three-line musing Khushwant Singh has summed it all up: The font of all wealth in Delhi has always been the coffers of the state, and there has always been something vaguely illegitimate about this. Was I so keenly aware of this when I wrote the three books I have set in this city? Perhaps not. But when I look back to what I have written, and how I view this city, I see how this fundamental logic works its way into my writing in one way or the other, as it does into the writing of almost all of those who have chosen to set their works here. People sometimes tell me, Delhi is like a character in your books. This is meant as a compliment, and I am very grateful to hear it, but two things always give me pause. The first reason I hesitate is a technical reason: I feel Delhi, any city, is more than a just a character, something larger, more powerful and more fundamental than a single character in a novel can hope to be. The second reason, of course, is that I have read Khushwant Singh’s Delhi and so whenever I am told that my writing brings Delhi to life, I feel guilty for accepting the compliment. I feel like I have stolen something that belongs to Khushwant Singh. In other words, I feel a bit like what, I guess, the contractors who built the Qutub Minar must have felt.